Meet Natsuki (ナツキ), Gorina (ゴリな) and KOKORO. 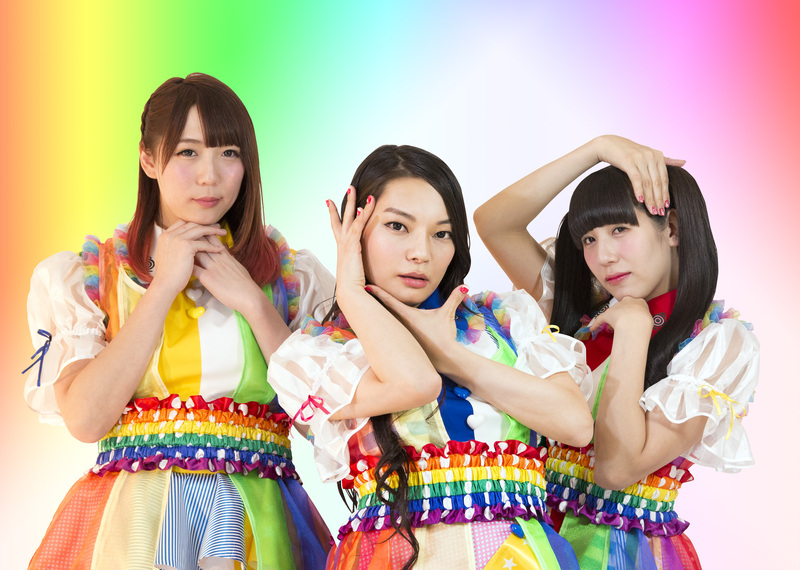 Together they form Himitsu no Otome (秘密のオト女) – Japan’s first ever transgender girl group. 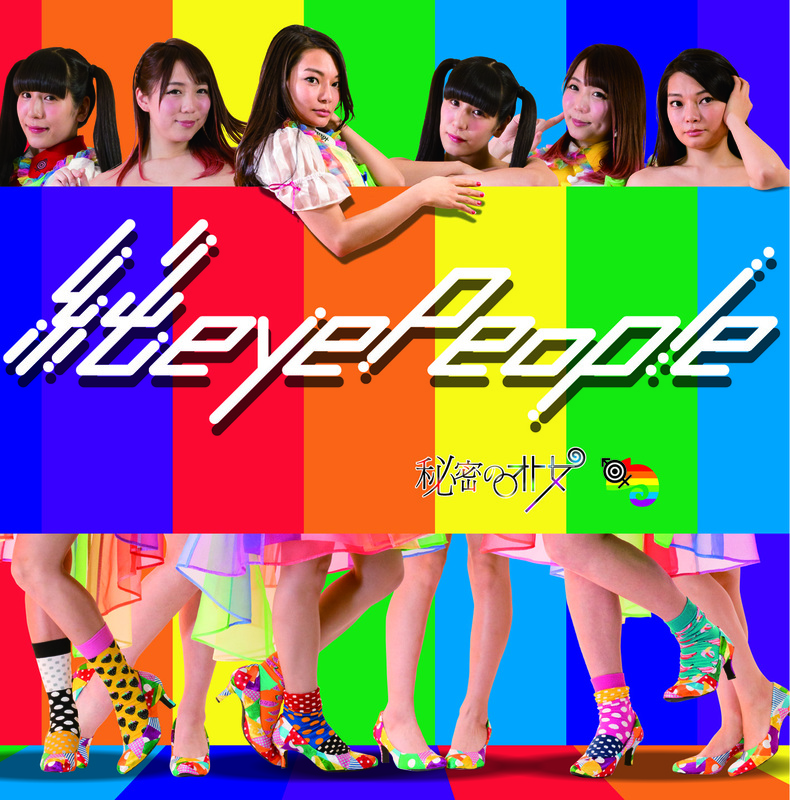 The three “sometimes cool, sometimes cute” girls of Himitsu no Otome (秘密のオト女) recently debuted ‘Jun eye People (純eye People)’, a fierce hand-clap driven dance bop powered by some even fiercer hand choreography in their eyewateringly colorful outfits. Amongst all of the frenzied colorful spotlights flashing away in the visuals for ‘Jun eye People (純eye People)’, one of them manages to put the light onto sexual abuse in the workplace. Hopefully that underlying narrative in the music video of the Himitsu no Otome (秘密のオト女) girls watching over and rescuing a potential sexual abuse victim is a preminiton of what’s to come from the group: protection and a voice for minority groups under attack in Japan and around the world. 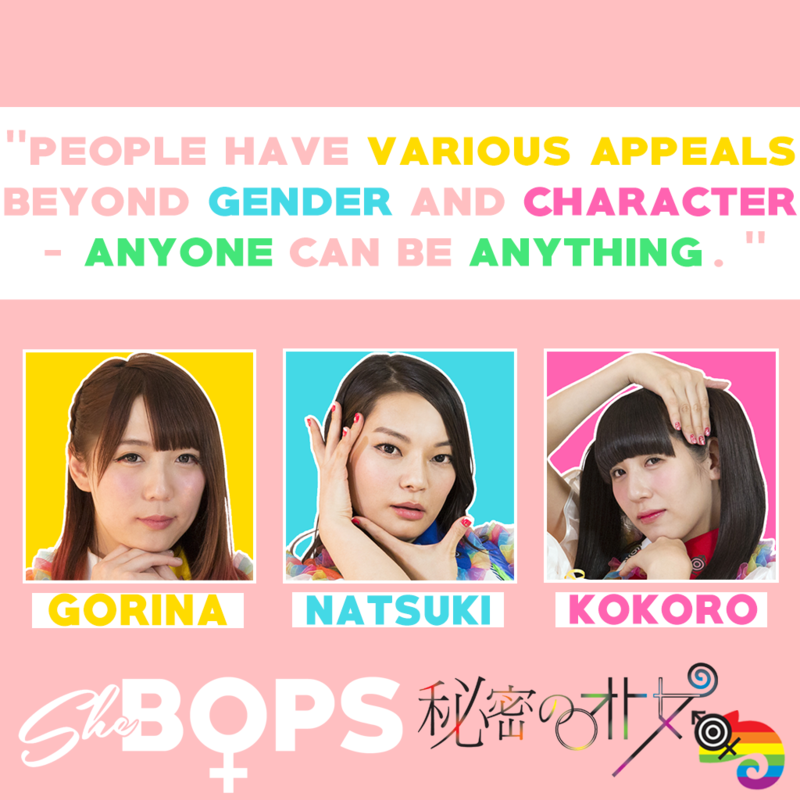 From SECRET GUYZ‘s debut to Tomoya Hosada‘s election to public office (making him the first transgender man in the world to do so) and an increasingly popular ‘genderless’ subculture, Himitsu no Otome (秘密のオト女)’s debut feels like another step in the right direction for positive LGBT representation in Japan and signifies the country’s growing shift towards transgender acceptance. In this exclusive interview, the three uniquely charismatic girls of Japan’s first transgender girl group share their heartbreaking experiences living life as transgender people in Japan, explain the significance of why they are represented by a rainbow colored chameleon and what their request for “a time when words such as LGBT have disappeared” means. What does Himitsu no Otome (秘密のオト女)’s group logo mean, especially the rainbow chameleon? Himitsu no Otome (秘密のオト女): The rainbow color is a symbol of the socialization movement of sexual minorities. The chameleon is an animal that can change to any color. By combining these things, we want to show that people have various appeals beyond gender and character – anyone can be anything. We have a wish that anyone can become anything. Himitsu no Otome (秘密のオト女) are “aiming towards a time when words such as LGBT have disappeared” – what is the reason? Himitsu no Otome (秘密のオト女): It is because the distinction for gender is not male or female. ‘L’ and ‘G’ and ‘B’ and ‘T’ have their own individuality, so we hope their unique personalities will be free from this distinction. What was the biggest challenge recording your debut single ‘Jun eye People (純eye People)’? Himitsu no Otome (秘密のオト女): It was difficult for three people with different voice types and personalities to harmonize. Since we were recording for the first time, we could not sleep the day before because we were so nervous. Which female singers have inspired you? Which female singers would you like to create a song with? Natsuki (ナツキ): I was inspired by Beyoncé, who was one of my favorites since my teens. I’d like to collaborate with Lady Gaga. I am fascinated by a performance that is not confined to existing concepts. Gorina (ゴリな): Morning Musume, since I was little. I loved Hello! Project – I love them even now! I want to perform together. KOKORO: Ai Otsuka. I love her cute melodies and lyrics. I learnt to sing by imitating her skills. Which element of the music industry excites you the most? Natsuki (ナツキ): To be able to transmit our music and messages all over the world through the Internet. Gorina (ゴリな): It is possible to express our world not only through the performances of singing and dance, but also with clothes and stage props. The best in the world is being cute! KOKORO: Live! The reaction from the audience is the best, and I become encouraged and excited because the reaction is different each and every time. Perfume has been particularly successful overseas, so how do you feel about overseas audiences who enjoy Japanese culture? Himitsu no Otome (秘密のオト女): We are very pleased because we love them and we are proud that Perfume are successful overseas. 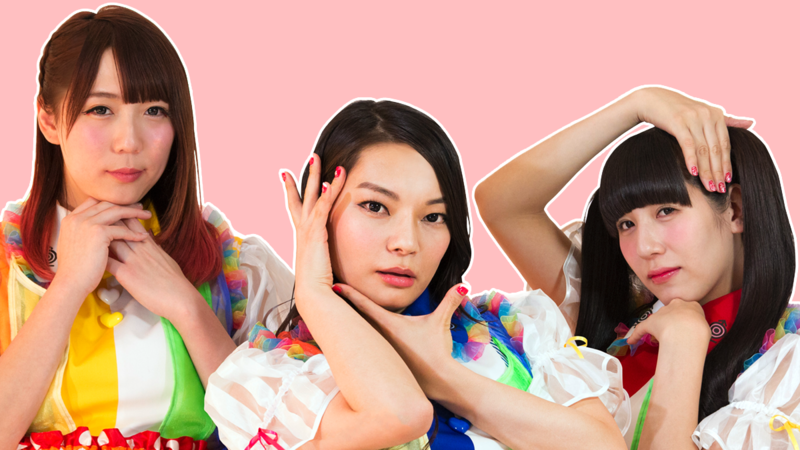 Like Perfume, we hope that someday we can reach and be loved by overseas fans too. It is very interesting that Japanese culture is recognized and appreciated by overseas audiences. Japanese idols and anime is a good gateway to know more about Japanese culture. What is your experience, living as transgender in Japan? Please explain in detail. Natsuki (ナツキ): Although I was asked to wear a boys’ uniform in junior high school, I had a strong sense of feeling out-of-place. I had a discussion with the school, and as a result I was able to go to school in a girls’ uniform. I was very happy. Gorina (ゴリな): Although I was called a lot of stupid and unpleasant things since my childhood, that experience strengthened me. I developed a strong belief, and I also became able to be considerate and empathize with others. If it were not for those experiences, there would be many things I would not have been able to notice and take into consideration. Also because of those experiences, I am now possible to be kind to others. KOKORO: I believed that I was a girl, but when I was in kindergarten I noticed that I was talked to as a male. When I became a junior high school student, I became a topic where people pointed fingers at me, talked about me in an abusive way, backbit and beat me. Even as an adult, people made remarks like “is that person a man?” or “is that some Okama*?” Walking outside became so emotionally difficult that I would panic if I could not isolate myself and block out all of the voices with earphones. There was also constant fear that my body would gradually resemble a man’s more and more as I grew up. What special message do you have for overseas fans? Especially other transgender people? Natsuki (ナツキ): I would be very happy if you will love us the same way that you would love your special someone. To other transgender people, I took a step towards my dreams! ! Believe in your power and make your dreams come true. Gorina (ゴリな): Do something you want to do without worrying about people’s eyes, as long as you do not inconvenience people. Wear the fashion you want to wear. Please enjoy your life. Enjoy what you like with confidence in your personality, even if you’re unusually different from other people. KOKORO: Everyone has a chance anytime. Please live your life as you want, but honestly and frankly. I endeavour to work hard and become the sunshine of your lives. What is your dream for your music career? Himitsu no Otome (秘密のオト女): We hope to deliver courage to people and put smiles on their faces and contribute to getting rid of prejudice against sexual minorities. We also want to leave behind one song which everybody in this life knows and can sing to themselves! Himitsu no Otome (秘密のオト女): We would like to be influential not just in Japan but also abroad. We would like to be an idol group that everybody knows.